This new innovative cleaner will keep your rolls clean and make them last longer! CeramClean II™ will effectively & efficiently remove dried ink from the engraving on your anilox roll without damaging the cell structure. New bottle is translucent so you can see how much product is left and reorder on time. This new bottle design has a black cap and easier to follow instructions. As with all cleaning products gloves & eye protection should be used. Squirt a quarter size dollop of cleaner on a clean damp rag. *NOTE: Water & UV based inks use water to dampen the cleaning rag/cloth. 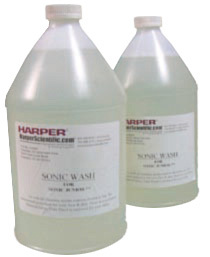 Solvent based inks you must use solvent to dampen the cleaning rag/cloth. using the chart on the reverse side. should not need to use any more cleaner. After cleaning the entire roll face with cleaner, take a clean rag & wipe off any excess. Ink should be present on your wipe off rag. 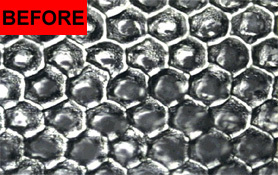 Rinse the roll thoroughly with water or solvent to ensure all the cleaning solution is free from the engraved cells. *NOTE: Water & UV based inks use water to rinse the anilox rolls off. Solvent based inks you must use solvent to rinse the anilox rolls off. Repeat this process as necessary. One cleaning should be all that is needed for the average roll. If your anilox roll is severely plugged with ink & has not been cleaned for a long period of time, repeat the process above until the clean wipe rag is free of ink residue. A good quality anilox roll scrub brush is the most cost effective maintenance tool your press operator can have! 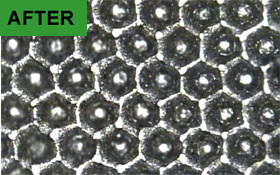 Each bristle is engineered at .003” diameter to agitate dried ink in the bottom of the cell. rollers only. Brass brush is for use on chrome anilox rollers only. Duro-Brush anilox cleaning brushes are designed with tapered, extended life plastic handles that resist the impact of water and pressroom chemicals. Their bristles provide improved agitation of dried ink in cell bottoms. 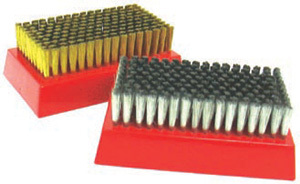 New brushes with stainless steel bristles are recommended for cleaning only ceramic anilox rollers. Brushes with brass bristles work best on chrome anilox rollers. Finally a safe and effective way to clean your anilox rolls in an ultrasonic cleaning tank!